One of the must attend sessions at this year’s Ontario Association of Broadcasters one day conference in Toronto on 10 November will see Jeff Vilder from Audio Insights present the results of a custom study designed specifically for the OAB on Radio’s place in the Canadian Audio Landscape”. Jeff was kind enough to share some of the early information with me and reports that even with the increased streaming to pureplay music services, broadcast radio remains alive and well in Canada, Of 1,505 Canadian adults surveyed, 6-in-10 listen to AM/FM daily, while slightly more than 1-in-10 turn to streaming music services daily. The pureplay leaders: Spotify (with 29% past week listeners among those who listen to streaming services >1x/week); Songza (17%); and the new Apple Music (11%). Other roadmap insights to be shared at the OAB session: streaming of AM/FM radio on smartphone, and interest in listening to FM chips on smartphones. Since the in-fighting between the big players in television effectively killed the CAB in Canada, the regional broadcasting organisations have stepped up to fill the void. Remember how we would all make the trip to Ottawa for the annual CAB conference to learn what was new, hear from the regulator, and, of course, network? In Ontario the Ontario Association of Broadcasters (OAB) has been organising an annual conference for the past few years and each year it seems to grow and get better. This year’s event is called “Connection 2015” and it happens in Toronto on Tuesday, November 10th. Here are 10 reasons why you need to be there. It’s a one day event. This is a fast-paced, action packed event with some world class speakers and great sessions, designed to give you actionable ideas you can take back to your radio station. The OAB conducts a survey each year to find out what broadcasters want to learn more about. Then the OAB program committee, of which I am a member, develops sessions around the most requested topics. The conference is held in a convenient location. It’s at the Toronto Airport Marriott Hotel which means you don’t have to deal with downtown traffic jams, pay crazy money to park, and if you fly in, it’s a short cab ride from the airport. You can do it all in one day, or come in the night before and stay in the hotel. In one day you will get as good, and in some cases better, content than you would by going to other broadcast conferences that last 3 days or longer. There is no need to fly to the Las Vegas, Los Angeles or London to attend a broadcast conference, as we bring the great content to you. The day starts with a keynote speech by James Cridland, the well-known and respected radio futurologist. Cridland will be exploring great radio ideas from across the world and what it means for all media companies. He’s going to talk about the station that doubled its listening hours by focusing on its digital brand; the radio station that’s also a TV channel; the country that’s turning off FM in two years; and the place where the most popular way to tune in to radio is via FM chips inside phones. Next is “Radio’s Roadmap to the Future”, moderated by Alan Cross with a panel that will discuss today’s challenges and what radio’s future business model needs to look like. Contributing to this session will be Geoff Poulton from Vista Radio, Jeff Detweiler from Ibiquity (HD Radio), Jeff Smulyan from Emmis Broadcasting (the FM chip/NextRadio), and Jeff Vidler who will present an exclusive audience study conducted by Audience Insights featuring new insights on consumer adoption and the growth of emerging audio technologies in Canada. Other a.m. sessions dig down into the nuts and bolts of how to make great radio. “We all know how important talent is to our industry and The OAB is very pleased to have John Derringer, the host of the highly successful Q-107 morning show, join us for an in-depth one-on-one conversation about how he got to where he is today and what he does to stay there,” Davies relates. Derringer will be part of the “Diving Deep into the Talent Pool”session hosted by Dave Farough who will be joined by Mike Monaghan from Vista Radio North Bay, Paul Kaye from Newcap, and Blair Bartrem from Corus Radio Toronto. Afternoon sessions continue, including two panels that are critical to radio’s success and growth. “Why Digital & Social Matters to Radio” is a follow up on last year’s popular digital panel that has Chris Byrnes hosting a group of smart digital radio broadcasters discussing apps, engagement, content and strategies for success in a bits and bytes world. You’ll hear from Ricki Lee for Aiir who provide websites and apps to radio stations all over the world. He will talk about how social tools help smaller radio stations compete with larger stations with more resources. Chris “Dunner” Duncombe, the Director of New Media for Corus, will tell you how to make Digital an integrated part of your strategies for success. Jamie Moffatt from StreamOn will talk about how to capitalize on the immediacy of radio, and what radio can learn from the demise of other mediums. Matt Mise is the Digital guru for Larche Communications and he will give you actionable ideas to build revenue for small and medium market stations using social, mobile, web and stream. Next up is “The $’s and Sense of Sales & Programming,” with Rogers Content VP Rob Farina moderating a panel with programmers and managers sharing usable and actionable ideas that can be put into play. The day’s schedule concludes with the annual Executive Town Hall. Chris Pandoff gets to play judge and jury on a panel that has Julie Adams – Rogers, Mario Cecchini – Corus, Paul Larche – Larche Communications, Jeff Smulyan – Emmis Radio, Raj Shoan – CRTC, and Rob Steele – President and CEO of Newcap Radio all sounding off. Closing off events is the Awards Gala dinner where the OAB recognizes great accomplishments made by Ontario’s broadcasters over the past year. Dinner guests will be there to cheer a slate of award winners, and welcome Canadian Broadcast Sales president Patrick Grierson into the OAB Hall of Fame, after which it’s more drinks, and a few more still in the suites upstairs. 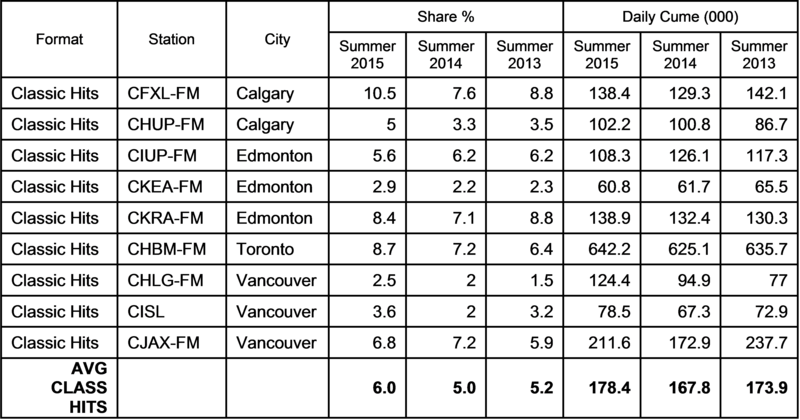 Now that summer is over we took a look at how radio formats are performing in the five largest Canadian markets. 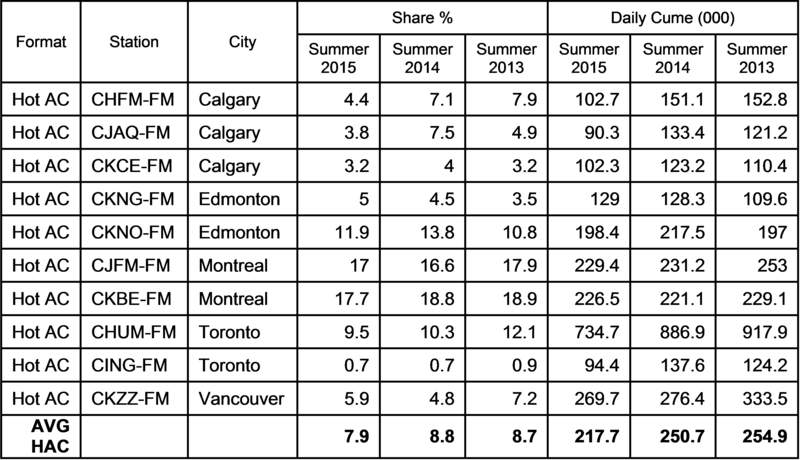 We looked at the Vancouver, Calgary, Edmonton, Toronto and Montreal markets, and studied the performance of each of the formats from the most recent 2015 summer survey period. We used the previous two summer books as a point of comparison and averaged the share of those stations in each format. In all cases we used Numeris PPM data Monday to Sunday 2am – 2am All people 2+ Share %. You may be surprised to learn which Canadian cities have the stations with the largest audience shares. The most popular format in Canada is News with an average share of 8.8%. News formats do better when there are elections on or when major events happen in Canada or the world and we seem to have had our share of major stories over this past summer. When the election is over and perhaps things return to “normal” it will be interesting to see how news holds up. However, the format is a consistent winner and has been the most popular format in these 5 markets for the past three summers, or longer. 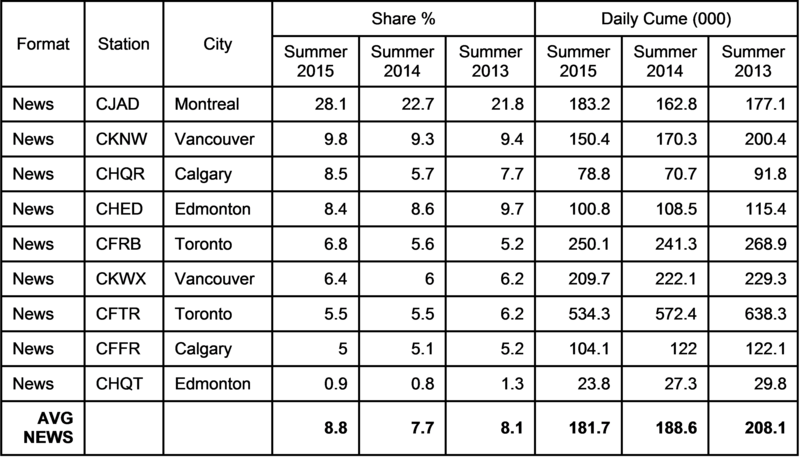 Last summer it slipped to a 7.7% average share, but that was a “slow” summer for major stories as I recall. The previous summer, news averaged an 8.1% share. CJAD in Montreal is not only the News station with the largest audience share (28.1%), it also boasts the largest audience share of any format across these five markets. The second most popular format is Hot AC and has a 7.9% average share across these five markets. There are 10 stations listed as playing Hot AC but the format has slipped almost a full percentage point from the summer of 2013, which is a concern. Calgary appears to be the most competitive Hot AC market in the country with three stations all claiming to own this format hill. But the station to check out in this format is in Montreal. It’s Cogeco’s 92.5 The Beat which has an almost exclusively female talent lineup, and boasts a 17.7% share. This is down slightly, by the way, from an 18.9% two summers ago. The format that is growing the most in Canada is Classic Hits and is tied for 3rd place with a 6.0% average share. It has grown from a 5.2% in the summer of 2013. Both Edmonton and Vancouver have three stations in this format. XL 103 in Calgary is the big format winner up from a 7.6% to a 10.5% this summer. The Newcap owned Boom 97.3 has also made some solid gains in Toronto. Country, with only five stations in the format, and one of them not really located in Toronto, is the other format that is tied for 3rd place, also with a 6.0% average share. This format has slipped a little from a 6.6% in the summer of 2013. The big performer in this format is CKRY in Calgary that boasts a 10.9% share. In fourth place is the Adult contemporary format with only five stations listed as playing AC in these markets. This format has an average audience share of 5.0%., which is down from a 5.7% in the summer of 2013. This format is challenged because it is no longer definable by a few core artists. The format has become a title driven format and has to share lots of titles with Hot AC and even CHR. QM in Vancouver is the station that is performing the best in this format based on audience share. It has an 11.4% share which is their best result in the last 3 years. Rock is the most popular format with 15 stations listed as playing Rock in these five cities. The format slides into 5th spot with a 4.8% average share. Rock is a format that also has its challenges because the new rock sound does not mesh well with the older classic rock songs. Programmers need to be careful not to play too many new and unfamiliar titles, or to fall into the trap of sounding old and boring by filling so many slots in the hour with potentially tired and burnt old rock songs. The stations that are performing the best are doing lots of music testing to ensure they are playing the best of the best songs for the target audience. Rock slipped from a 5.4% in summer 2013 to a 4.9% in summer of 2014, and this past summer saw another small drop. “The Spirit of Rock,” the Bell owned CHOM in Montreal, is the station that performs best in this format with a 12.2% audience share. Rounding out the top 6 best performing formats with 12 stations is CHR. It has a 4.1 % average share which is down slightly from a 4.4% two summers ago. This format seems to share lots of titles and artists with Hot AC on one slide and Urban and even some rock on the other end of the format. The best performing CHR station is 94.5 Virgin Radio in Vancouver with a 6.8% average share. While this looks good it is well down from the 9.2% this station returned when it was positioned as The Beat. Averaging audience shares in just one way of measuring the performance of formats, and we get that each market has its differences. There are many factors that determine a radio stations success. We strongly believe radio stations win because they are great 365 days of the year. They focus on five key elements and get of them right all of the time. Oct 2 “World Smile Day”: A day dedicated to good works and good cheer. Do an act of kindness and help one person smile. See www.worldsmileday.com. Oct 5 “World Habitat Day”: see www.un.org. Oct 9-17 “Oktoberfest” The second largest Oktoberfest in the world is held in Kitchener, Ontario. More than 700,000 people attend the 70 events over the week. Call the organizers for more info 519-570-4267, email info@oktoberfest.ca, or visit www.oktoberfest.ca. Oct 10 “Universal Music Day:” This day advocates, celebrates and encourages profound gratitude for music, musicians and music teachers. Call Susan Patricia Golden, Family Music Network 727-804-4908, email info@UniversalMusicDay.org. See www.UniversalMusicDay.org. Oct 12 “Thanksgiving Day”: Observed in Canada on the second Monday in October each year. Oct 12-18 “Citizenship Week”: Canada’s Citizenship Week is intended to encourage all Canadians to reflect on the value of citizenship and what it means to be Canadian. See www.cic.gc.ca/english/celebrate/citweek.asp. Oct 17-25 “National Chemistry Week”: To celebrate the contributions of chemistry to modern life and to help the public understand that chemistry affects every part of our lives. Call the American Chemical Society 1-800-227-5558, ext 6097, email ncw@acs.org. see www.chemistry.org/ncw. Oct 19-25 “Waste Reduction Week”: Canadian campaign to reduce waste. See www.wrwcanada.com. Oct 22 “Yom Kippur”: This is the Day of Atonement in the Jewish faith and their most holy day of the year. Oct 24 “Make A Difference Day”: A national day of community service. For information call 800-416-3824 or visit www.makeadifferenceday.com. Oct 25 “Mother-in-law Day”: Traditionally the 4th Sunday in October is the occasion to honour mothers-in-law for their contribution to the success of families and for their good humour in enduring bad jokes.